In this discussion paper, Gavin Coney, Head of Clinical Products here at Clarivate Analytics, sets out the key trends in targeted clinical strategies and examines how biomarkers are being applied within trial design and in the selection of patients. In this exclusive discussion paper, Gavin goes on to explore how to demonstrate efficacy and suggests areas to focus on to drive success. With comprehensive information on clinical trials and rare diseases, gene variant and biomarker indexing, and links to biomarker and ontology APIs, Cortellis delivers what you need to improve trials success rates. Cortellis Clinical Trials Intelligence holds expertly curated information on over 250,000 trials with extensive data on patient segmentation. 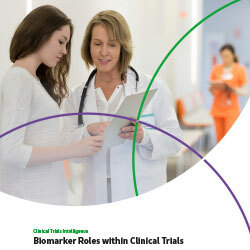 Get detailed insights on specific trial designs including biomarkers, targets and indications. Identify trial designs associated with success or failure around: end points, inclusion/exclusion criteria, active control, dose range/regime. Save time analyzing findings and develop new insights with clear and dynamic visualizations. Further, with the Biomarkers Module of Integrity, you get in-depth information to support the identification and validation of biomarkers to use in patient stratification.